Frequent laughs and funny performances will translate well to video. Congratulations Matthew Perry, for being the second member of the "Friends" cast (after Lisa Kudrow) to find a big screen starring vehicle that's actually funny. A screwball comedy of compounding complexity, "The Whole Nine Yards" casts Perry as Nicholas "Oz" Oseransky, a miserably married Montreal suburbanite whose nervous nature kicks into overdrive when a mafia turncoat known as Jimmy The Tulip -- a hitman so cool he's played by Bruce Willis -- moves in next door, looking for a little R and R after ratting out the mob. When Jimmy wants to be pals, it's an offer Oz thinks he'd better not refuse, but he sweats bullets reading Scorsese-movie innuendo into every innocuous thing his neighbor says, like "Let's go for a drive." Yikes! He's particularly frazzled when his shrewish, back-stabbing, sexpot wife (Rosanna Arquette, sporting a bad French-Canadian accent) wants to knock Jimmy off for the price on his head. She packs Oz off to Chicago to find The Tulip's old gang, then once he's gone she comes on to the not-so-reformed mobster, hoping he'll kill Oz for a cut of some insurance money. Both precociously silly and thickly sardonic, "The Whole Nine Yards" benefits most from its fantastic casting. Perry is ideal as an apprehensive doofus prone to fits of clumsy slapstick and Willis hasn't been this charming and droll since his "Moonlighting" days. Equally funny is Amanda Peet ("Body Shots") as Oz's dental assistant and, it turns out, a contract killer wannabe who turns into a giddy groupie when she meets Jimmy. "I've followed your career since I was a kid!" she squeals. 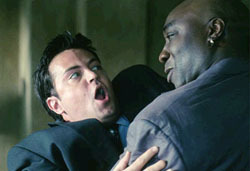 "The Green Mile's" gentle giant Michael Clarke Duncan plays a menacing mob enforcer with a disarming smile. Natasha Henstridge ("Species") is Jimmy's classy and unflappable estranged wife who he's too moral to divorce, but not too moral to snuff out -- especially after Oz becomes smitten with her. And Kevin Pollak has a ball goofing on his mob boss role with grinding-gears temperament and a deliberately bad Hungarian accent. When Duncan, Pollak and Henstridge make for Montreal with manifold motives on their minds, the plot gets all kinds of complicated with double-crosses, murders and I-got-a-plan moments. But director Johnathan Lynn (who hasn't made a truly hilarious comedy since "My Cousin Vinny") holds it all together with a borderline-zany consistency. "The Whole Nine Yards" hiccups a few times as it draws toward an absurd but whimsical conclusion, but this is mob comedy done right. "Analyze This" might have had a better premise, but it wasn't half this funny.